The origins of the Sacred Steel tradition in gospel music date back to the 1930s in African-American Pentecostal churches where the steel lap guitar, also known as the Hawaiian guitar, was used often, substituting for the more expensive pipe organ common in the churches of larger sects. It was in such a church that Robert Randolph honed his musical skills. Born in 1980 in a deeply religious family, Randolph learnt and played the pedal steel guitar in a House of God Church in New Jersey, spending much of his adolescent years immersed in playing gospel music. So much so that for much of his teenage years, the only kind of music he knew or was exposed to was religious music, not blues, funk, rock or jazz. 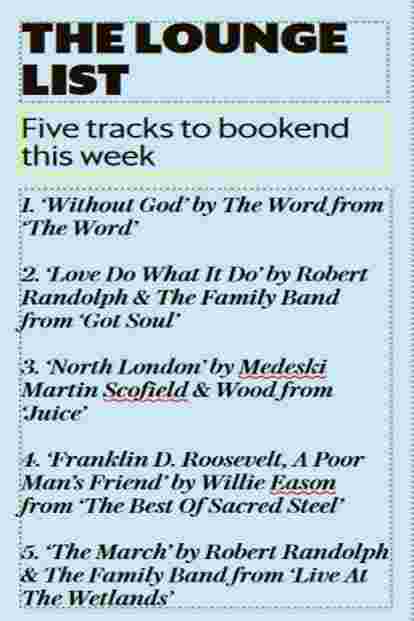 By the early 2000s, however, Randolph had made the leap to more secular music. Today, he is the best-known virtuoso of the pedal steel guitar, embracing genres as diverse as those he got exposed to late, garnering a fan following among the aficionados of blues, soul and rock and becoming a fixture on the jam band circuit. Indian blues fans got a whiff—actually a couple of whiffs—of Randolph’s music when he came for the Mahindra Blues Festival in 2012 and 2013. At one of his appearances, he jammed with blues greats such as Buddy Guy and Taj Mahal and those who watched his set at Mumbai’s Mehboob Studios in 2013 will likely recall the joyful and fast-paced sound of the music that he and his band make. They may recall as well the exuberance of his live performances, which often saw him abandoning his seat at the guitar and breaking into dance, exhorting the crowd to dance and scream. There’s a compilation album of the Mahindra Blues Festival 2013 that features two tracks by Robert Randolph & The Family Band—The March and I Don’t Know What You Come To Do—and both can give you a taste of what his live sets are like. Neither of those songs is religious but Randolph’s wailing steel guitar, the deep lines of his bassist, and the urgent beat of the drummer can build up a fervour in the audience that is not unlike the way gospel services are conducted by preachers, singers and musicians in many Pentecostal sects, where the congregation is transported to feverish heights. Randolph is great on his albums as well. This summer, he released his fifth studio album, Got Soul, a record that reinforces his status as the pedal steel guitar’s most innovative exponent. His style of playing—a relentless super-speed pace and frequent wailing—can seem to make the steel guitar appear like a vocalist reaching feverish high pitches and searing through everything else. The new album has, in addition to his own gospel-infused style of singing, guest vocalists—Hootie & the Blowfish’s Darius Rucker, jazz singer Cory Henry, and soul singer Anthony Hamilton. All three are accomplished singers (Hamilton’s Comin’ From Where I’m From was a hit single in the early 2000s; and Hootie & the Blowfish had a super-hit album, Cracked Rear View, in the mid-1990s) and make great contributions to the album but it is Randolph’s guitar which, as always, steals the show, adding passion and emotion that recalls gospel’s spiritual fervour. The 12 songs on the album are tightly produced and have a big room-filling sound but the standout track has to be Love Do What It Do, which features Rucker in a stellar performance. Randolph’s first major album was not with his own band. It was as part of another group, The Word, which featured musicians drawn together by their common love for sacred steel’s tradition and for gospel: Randolph, John Medeski (keyboardist for jazz-funk band Medeski Martin & Wood) and Luther and Cody Dickinson (of southern blues-rock band North Mississippi Allstars). The Word took Sacred Steel’s gospel tradition, fused it with jazz and funk, and stripped it of vocals to create instrumental improvisational music. The Word toured intermittently but also released an early eponymous album in 2001 which received high praise and gained popularity, particularly among jam band audiences. Shortly after that, Robert Randolph & The Family band was formed; it features Randolph’s siblings, Marcus (drums) and Lenesha (vocals). The band’s first album was a live one, recorded at the now defunct New York venue The Wetlands Preserve. The band’s first studio album, Unclassified, came out in 2003—by then Randolph was getting a great deal of attention. Eric Clapton, for instance, was impressed and got him to tour with him. On subsequent albums, Randolph and his band have collaborated with some of contemporary music’s greatest names. On 2013’s Lickety Split, guitarist Carlos Santana and jazz musician Trombone Shorty feature as guests, and Randolph himself has played as a guest with big names such as Ozzy Osbourne, Ringo Starr, Elton John and the late Leon Russell. Today, the young boy who learnt his music in church and grew up on gospel, is a fixture on the jazz and blues circuits and rips up arena-filling audiences with his scorching steel guitar. If blues, jazz and funk are your scene, then Robert Randolph ought to be on your playlist.